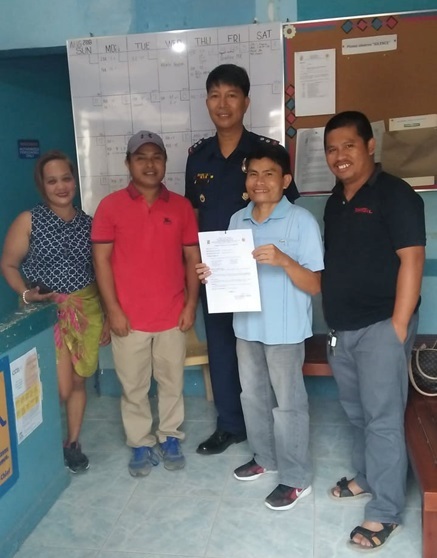 Members of the Bohol Provincial Police Office Press Corps, (L-R) Helen Castaño, Leo Udtohan, Dave Responte and Rey Tutas receive from Chief Insp. David Patriana (back) results of a voluntary drug testing conducted on members of the group last week. Nine members of media covering Bohol’s police beat tested negative for illegal drug use after they voluntarily underwent drug testing at the police headquarters in Camp Francisco Dagohoy, Tagbilaran City last week. Chief Insp. David Patriana, chief of the Bohol Police Office Crime Laboratory, said that the members of the BPPO Press Corps showed no traces of methamphetamine or shabu and tetrahydrocannabinol, the main active ingredient in cannabis. The drug testing was conducted on August 16 after a press conference at the BPPO multipurpose hall during the launching of a “One-time, Big-Time” operation which led to the arrest of 39 drug suspects and the death of two men who were also linked to the illegal drug trade. Meanwhile, the BPPO Press Corps called on other members of media to also voluntarily undergo drug testing to set an example for the public. Members of the newly formed media group earlier said that the initiative was launched also as support for the police’s continued campaign against the illegal drug trade.